Take 3 liquid capsules with 10 oz. of water 30 minutes before breakfast and repeat 30 minutes before dinner. On training days take one of your daily servings 30 minutes before working out. For optimum results use NIOX™ every day. Stay well hydrated. 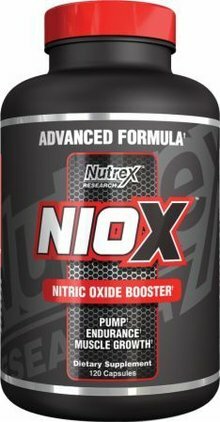 Always take NIOX approximately 30 minutes before a meal or workout. For optimum results use NIOX every day. Stay well hydrated and drink at least 72 oz. of water on a daily basis. Always take NIOX on an empty stomach approx. 30 minutes before a meal or workout as food or a full stomach will diminish the effects of this product. Up to 200lbs: 8 Fast-Acing Liqui-Caps Per Day. Take 4 Liqui-Caps with 10 oz. of water 30 minutes before breakfast and repeat 30 minutes before lunch. On training days take one of your daily servings 30 minutes before working out. Over 200lbs: 12 Fast-Acting Liqui-Caps Per Day. Take 4 Liqui-Caps with 10 oz. of water 30 before breakfast and repeat 30 minutes before lunch and 30 minutes before dinner. On training days take one of your daily servings 30 minutes before workout. Do not use if you are pregnant or nursing. Consult a physician or licensed qualified health care professional before using this product if you have history of cold sores or if you are currently using prescription drugs. KEEP OUT OF REACH OF CHILDREN.